Golding Jobber No.7. 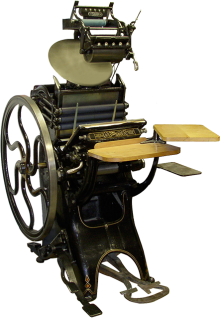 This example is a “new” style which had many engineering changes and is recognizable by the full width nameplate below the platen. The Jobber No. 7 has a chase size of 10″ x 15″ and many features for the professional printer. One of the more unusual features (found on all Jobbers) was the platen adjusting system. It worked on a system of wedges rather than the impression bolts found on most presses. The system allows the pressman to move the top or bottom of the platen in or out by simply turning one of two thumb screws.